The first command, router eigrp ASN_NUMBER, enables EIGRP on a router. ASN_NUMBER represents an autonomous system number and has to be the same on all routers running EIGRP, otherwise routers won’t become neighbors. The second command, network SUBNET, enables EIGRP on selected interfaces and specifies which networks will be advertised. By default, the network command takes a classful network number as the parameter. The command above lists all EIGRP neighbors. The address field lists the neighboring router RID (router ID). The interface field shows on which local interface the neighbor relationship has been formed. The D character at the beginning of a line in a routing table indicates that the route has been learned via EIGRP. Router R1 has two directly connected subnets, 10.0.0.0/24 and 10.0.1.0/24. We want to enable EIGRP only on the subnet connected to the interface Fa0/0. 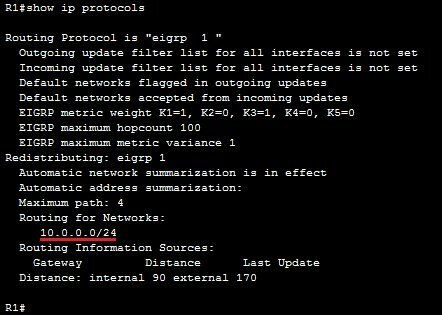 If we enter the network 10.0.0.0 command under the EIGRP configuration mode, both subnets will be included in EIGRP process because we’ve used a classful network number in the network command. To configure EIGRP only on interface Fa0/0, the network 10.0.0.0 0.0.0.255 command can be used. This will enable EIGRP only on interfaces starting with 10.0.0.X.